In my last post I recalled how the industrial action of the Association of Broadcasting Staff (ABS) delayed the implementation of 24-hour broadcasting on Radio 2. By December 1978 that action culminated in the brief merger of Radios 1,2,3 and 4 to form the All Network Service, or Radio 10 as it was informally known. On Friday 22 December the ABS called an all out strike and from 4 p.m. the four national networks became one. That evening’s schedule proved a fascinating mix of musical and broadcasting styles. That same evening an agreement was reached, mediated with ACAS, and union members were granted a 12.5% pay rise. The networks returned to virtually normal broadcasting the next day apart from some minor disruption on Radio 4 such as Any Questions being replaced with a programme about Joyce Grenfell and the dropping of Kaleidoscope Encore. In fact radio got off lightly as that week TV screens were blacked out as BBC 1 and BBC 2 went off the air from Wednesday 20 December. 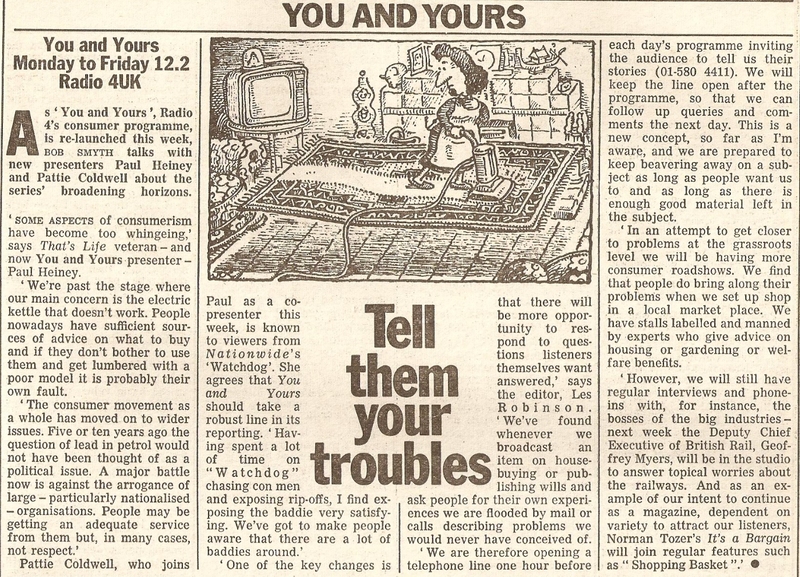 For a short while viewers in the Yorkshire TV region had no TV at all as YTV was also suffering from separate industrial action that shut the channel from the Monday of that week. 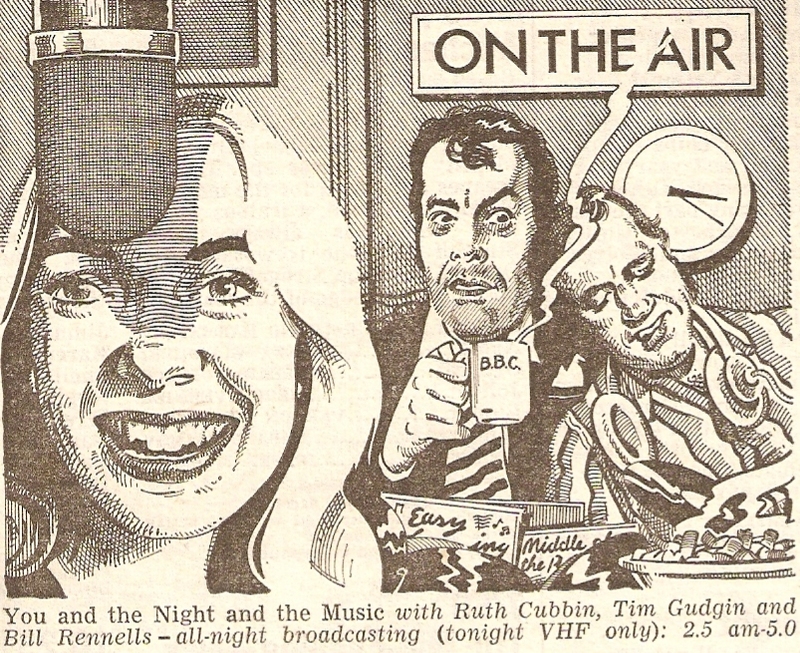 Bill Rennells went on to be regular overnight presenters. insomniacs could only tune through the dial to hear the World Service, the odd foreign station or just a load of static. It was back in 1965 that the Light Programme started to extend its broadcasting hours with a 5:30 a.m. start and a 2:00 a.m. closedown. Both the Home and Third tucked their listeners up in bed before midnight. This pattern continued into the 70s with just an extra half-hour added to Radio 2, with a 5:00 a.m. start, in 1972. 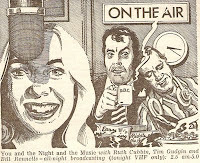 The economic crisis and tight licence fee settlements meant cutbacks in 1975 when Radios 1&2 kicked off at 6:00 a.m. and closed at 0:30 a.m. Later that year another 30 minutes was lost with closedown after the midnight news. During this decade Britain’s first batch of 19 independent radio stations were opening and the large city stations – Capital, LBC, Clyde, BRMB, Piccadilly and City – offered 24 hour listening. In the event Radio 2 opted to go 24-hour in the early hours of 23 November, to coincide with the frequency changes. 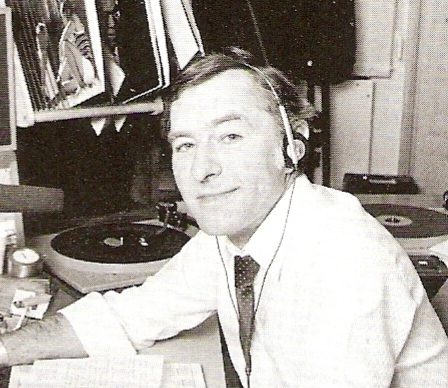 The Radio Times showed that a new series called You and the Night and the Music was due on the air at 2:00 a.m. -the first presenter was to be Bill Rennells with a rota of announcers hosting on a daily basis. This was the plan – but it failed to happen and that night Radio 2 closed down as usual. Industrial action by the Association of Broadcasting Staff (ABS) meant that Radio 2 had to delay its round-the-clock programming until early 1979. The ABS action culminated in the shutdown of BBC tv and the temporary merging of all the radio networks on 22 December 1978. The new launch date for You and the Night and the Music (or YATNAM in BBC acronym-speak) was rescheduled to the early hours of Sunday 28 January 1979. The first presenter was to be Colin Berry and he popped into Ray Moore’s Late Show to talk about You and the Night in a live link-up with BBC2 tv where the continuity announcer is Jenni Bayle. As you’ll also hear the programme had a ready-made theme with the opening version from Jack Jones. The closing theme was an orchestral arrangement of the tune by Manuel and his Music of the Mountains (aka Geoff Love). Like Night Ride, Music Through Midnight and The Late Show before it, YATNAM was presented by the continuity team. Initially it was a different announcer each night but by the end of its run they would host 3 or 4 shows per week. Here are a three programme excerpts all taken from 1980 featuring Vivien Stuart, James Alexander Gordon and Sheila Tracy. As you’ll hear even from these brief clips needletime restrictions meant that the programme relied heavily on BBC session recordings. In the show presented by Sheila Tracy you would’ve heard, as well as the BBC Midland Radio Orchestra, the BBC Scottish Radio Orchestra conducted by Brian Fahey, the BBC Northern Radio Orchestra conducted by Brian Fitzgerald, the BBC Radio Orchestra, the BBC Big Band, the Mike Sammes Singers, the Colin Campbell Trio and the Quartets of Harry Stoneham, Tommy Whittle, Ray Swinfield and Harry Pitch. Actual records were few and far between. 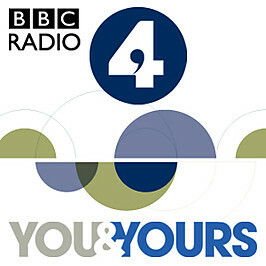 The final You and the Night and the Music went out on 20 January 1984, presented by Richard Clegg. It was replaced by Nightride (not to be confused with the late 60s/early 70s Night Ride) with Jean Challis hosting the first show. The actress and comedienne Janet Brown sadly died yesterday. Perhaps best known on TV for her appearances in Who Do You Do? 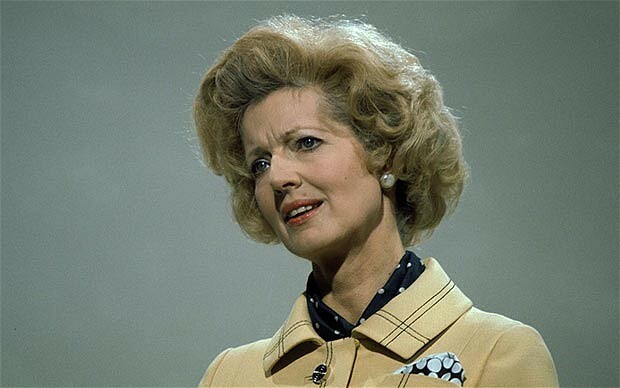 and The Mike Yarwood Show she became famous for her impression of Maggie Thatcher. Janet was also a regular on the radio appearing on Radio 2’s The Impressionists and the early series of The News Huddlines. 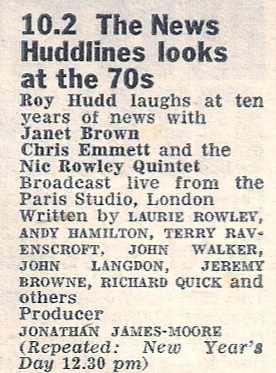 By way of a tribute here’s The News Huddlines review of the 1970s demonstrating the vocal dexterity of both Janet Brown and Chris Emmett. So, if you remember the 1970s (and Joyce McKinney!) enjoy this canter through the decade with Roy Hudd. The programme was broadcast live on Sunday 30 December 1979, the announcer is Richard Clegg and in the studio is David Bellan. There’ll be more from The News Huddlines in a future post. This week BBC Radio has a rare piece of cross-network co-operation when one long-running programme pays tribute to another. Tomorrow night Friday Night is Music Night celebrates Desert Island Discs in a special two-hour concert. Sue’s first castaway was Quintin Hogg, better known as Lord Hailsham. The programme was broadcast on Sunday 27 March 1988 and you can find further details on the Desert Island Discs website. Here’s an edited version of the programme. From January 1992 a BBC tv promo for the Radio Times when the programme was celebrating its 50th birthday. Read more about Desert Island Discs on Suite 101. As the D-Day of 23 November 1978 approached BBC Radio was running this promotional material for all the networks, though I can only recall it being played out on Radio 4. Again the publicity is voiced by David Symonds. On the 22nd over on Radio 1 Dave Lee Travis was telling his listeners about the changes. The promo was voiced by the unlikely combination of John Snagge and Kid Jensen. Later that day the Radio 4 Six O’Clock news outlined the engineering aspect of the work required. Reporter Nicholas Jones spoke to Chief Engineer Duncan McEwan and Head of Radio Aubrey Singer. The newsreader is Susan Denny. At 11p.m. on Radio 2 Brain Matthew kicked off Round Midnight. The final long wave station identification was given by James Alexander Gordon. Over on Radio 3 John Holmstrom was closing the network for the day and offering concerned listeners reassurance and how to avoid hearing “the Albanian Archers”. At midnight 1500 metres long wave switched from Radio 2 to Radio 4. Here’s Brian Matthew before midnight and David Symonds after midnight (I cheated slightly and recorded this on VHF). I assume this is the first play of Sailing By. Radio 2 had planned to be broadcasting 24 hours a day at this stage but industrial problems prevented this, so the station closed at 2 a.m. and re-opened at 5 a.m. The early morning announcing shift was taken by Presentation Editor Jimmy Kingsbury. The Early Show is presented by Tony Brandon. Radio 4 opened at 6 a.m., David Symonds on overnight announcing duty. At 7a.m. Radio 3 was on-air with announcer Cormac Rigby in particularly poetic mood. On 275 and 285 metres DLT (aka “The Hairy Cornflake”) welcomed Radio 1 listeners. In this news report from Radio 4 Mike Wooldridge reviewed the mammoth task to change over the transmitters. Radio 1 was running a Jaws 2 Competition by asking you to name all the DJs in the wavelength jingle. On Newsbeat Laurie Mayer spoke to Eileen Mullan who was in charge of the publicity for the changeover. And to close, that week’s News Huddlines seemed confused by the whole exercise. Its amazing how under-represented some programmes are in the BBC’s Sound Archives. For instance Housewives’ Choice ran on the Light Programme from 1946 to 1967 but the only clips they seem to have are about a minute of Kenneth Horne and even less of George Elrick. So it’s often those home taped recordings that help fill the gaps in the official archive, a 40-minute excerpt from a 1950s edition of Housewives’ Choice presented by Bob Danvers-Walker can be found on the internet. 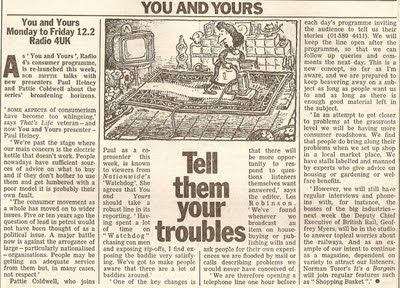 I mention this because another long running programme, this time Radio 4’s daily consumer magazine programme You and Yours celebrated its 40th anniversary last year. The Radio 4 blog includes some early examples of the show (see links below). But apparently only five editions from the whole of the programme’s first decade exist. The head of the archive explained that “space was limited back then and programme makers didn’t keep a comprehensive record of what went out on air. The idea was more to select programmes, extracts of programmes, and sometimes commission new recordings itself that were either of clear historical value or would be of likely repeat or re-use to future programme makers. So highly topical content of the sort on You and Yours although a precious record of social history now, may well have been seen by producers as ephemeral”. However, I’ve also found this complete edition from 9 May 1983. The programme was now presented by Pattie Coldwell (ex Nationwide and later to present Open Air who died at the age of 50 in 2002) and Paul Heiney (ex Radio Humberside and one of Esther’s boys on That’s Life, currently on ITV1's Countrywise). The programme includes reports on money lending, women’s self-defence and talking bus stops. Can you help identify this piece of music please? It was used as a closing theme on Radio 2's Early Show﻿ in 1980, in this case by Ray Moore. If memory serves it may have also been used by Steve Jones who was also hosting The Early Show at that time. Here's a clip from a show in April 1980. If you know the name of the tune and/or the orchestra please email me. Here’s a gem of a feature from the 60th anniversary of The Third Programme in 2006. It’s a montage of sounds celebrating the history of the network and includes a sterling effort by announcer John Holmstrom as he fills during a Proms concert. The programme was broadcast on BBC Radio 3 in the Between the Ears strand on 30 September 2006 and is produced by Alan Hall.